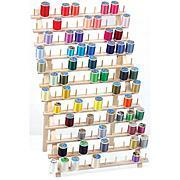 JUNE TAILOR-Cone Thread Rack. 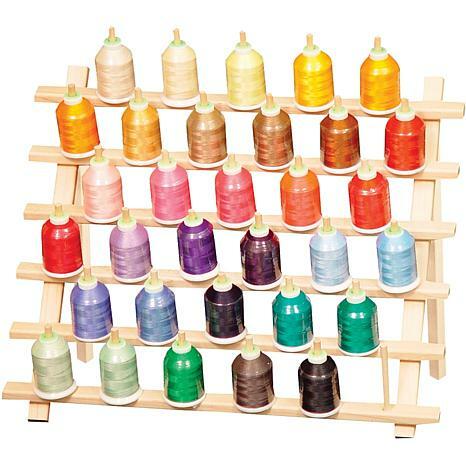 This solid wood coned thread rack has a thirty-three cone capacity. 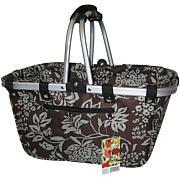 Flip-out back leg enables tabletop use that can be easily stored when not in use. Rack measures 13-1/2x15-5/8x8in. Imported. 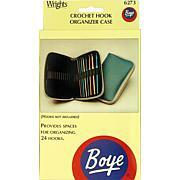 I love this, more storage for my washi tapes! 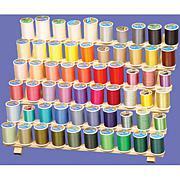 These fit your large spools of serger thread and large sewing thread spools. June Tailor is the only one who has it and it took me some searching to find them. I think I have 3 and would like to get one more. Nicely made and easy to see all the colors on hand. Wish I had bought 2 . Would recomment to others. I bought this as it specifically says it has a keyhole hanger for easy hanging but in fact it contains no hanging hardware at all. I tried buying some to add myself but the wood was too soft to successfully manage to hang it. Sending this back!